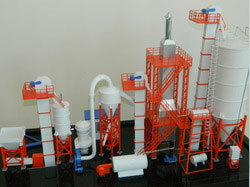 We are engaged in offering the best quality range of Automatic Plaster Of Paris Plant in india. The natural gypsum powder includes anhydrous gypsum and CaS04.2H2O, if you want to commercialize the gypsum powder, you should adopt the CaS04.2H2O, after removing part of water by heating, it will become CaS04.1/2 H20. CaS04.1/2 H20 is the final product which you can use it to produce gypsum board other gypsum product. After calcining, CaSO4.1/2H2O is widely used in paper faced gypsum board and gypsum block and painting gypsum powder and model. Natural gypsum generally includes dehydrate gypsum and anhydrous gypsum. In order to get the valuable materials, generally, we get semi-hydrated gypsum through heating the dehydrate gypsum. The calcined semi-hydrated gypsum can widely be used for plasterboard, decoration board, gypsum block, stucco gypsum, and molding gypsum etc Content of CaSO4·2H2O in gypsum mine > 80%. Because adopt low-temperature heat source, so the gypsum is not easy to be burnt, as long as the temperature is controlled properly, there will not have CaSO4 2H2O in the finished product, and the anhydrous gypsum is within 5%, and the rest are CaSO4 1/2H2O. In order to reach the above requirement, our company have researched and developed a whole set of boiling furnace processing technology, the main material is good-quality steel. For example, heat conductive oil pipe adopts seamless steel pipe (GB3087-82). Steel plate adopts carbon steel and low-alloy steel (GB713-86); Frame steel adopts international product .Furthermore, in the work of welding, all the workers have work certificate, after welding, the coil pipe will have a water pressure test, just in case of leakage of heat conductive oil. The product is qualified if there is no leakage under the water pressure of 1.0~1.5Mpa for 24 hours.